UV Disinfection Technology: Is it Worth the Cost? With a rise in the prevalence of hospital-acquired infection (HAI) rates and the escalating emphasis in this area linking federal reimbursements to performance, hospitals have amplified their focus on new ways to combat this issue. In addition to rigorous personal hygiene protocol, the industry has seen an increased focus on more thorough cleaning by Environmental Services with the expanded use of accelerated hydrogen peroxide products, bleach and other similar disinfectant products. 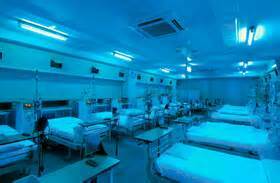 In addition, ultraviolet (UV) disinfection technology is increasing in use and acceptance in the healthcare industry. While the cost of this technology can appear prohibitive, with equipment ranging from $10,000 to $120,000, the potential reduction in infection rates can justify the price tag. According to the CDC, 1 in 20 patients will incur an HAI during the course of their hospital stay at an estimated cost of $1,000-$25,000 apiece.1 Stubborn, hard-to-control microorganisms such as methicillin-resistant Staphylococcus aureus (MRSA), Clostridium difficile (C. diff), and vancomycin-resistant enterococci (VRE) have become prevalent in the hospital environment and intensify the HAI issue. One study of the Pennsylvania Healthcare Cost Containment Council showed that of the patients who acquired an infection during their hospital stay, 29.8% were readmitted within 30 days for an infection or complication. Of the patients without an HAI, 6.2% were readmitted within 30 days for an infection or complication.2 Fortunately, UV disinfection technology is showing promise in the treatment of patient rooms and sterile surgical environments. The use of UV technologies installed in air handling units of a hospital’s HVAC system is intended to improve indoor air quality, increase energy efficiency, reduce environmental impact, increase sustainability, and improve operations and maintenance by optimizing building operating efficiencies. With this emerging technology, several companies have introduced viable solutions in this area. Xenex, TRU-D, and other UV disinfection devices have appeared in the healthcare market, and others continue to surface with increasing frequency. The reduction rate potential in C. diff, MRSA, and other microorganisms is impressive. One hospital in the Northeast has claimed documentation of MRSA reduction in their ICU to equal zero after implementation of Xenex technology and more rigorous standard methods in cleaning, personal hygiene, and inspection procedures. Disinfection cycle time is a critical factor in the operational equation. The more efficient units boast cycle times of 15 minutes or less. This technology is not typically used for disinfecting every hospital discharge room due to the additional time potentially needed to run the UV technology. A more standard procedure is to use the UV device in isolation or in compromised patient rooms. The same is true for operating room suites, leading some hospitals to use the technology during the end-of-day terminal cleaning. In addition to the initial cost of the machine, there can be monthly maintenance and service charges. Likewise, additional machines may be required to address the demands of a hospital depending on bed size, number of operating rooms, etc. The UV disinfection equipment manufacturers claim a return on investment that is based on reduction of HAI cases. The average cost of HAI infections is determined, and the reduction of cases provides a quantifiable estimate of dollars saved. The cost of the technology investment is thus offset by the savings generated in HAI reduction. Hospitals using UV technology note that a combination of tools and technologies, including UV disinfection technology, are able to reduce certain infection rates to zero, as well as save into the millions of dollars by reducing HAI costs. As UV disinfection technology continues to evolve, proven reduction of HAI rates could make this a cost-effective option for hospitals to consider. 1. Scott RD. The Direct Medical Costs of Healthcare-Associated Infections in U.S. Hospitals and the Benefits of Prevention. Centers for Disease Control and Prevention. March 2009. 2. Pennsylvania Health Care Cost Containment Council. The Impact of Healthcare-associated Infections in Pennsylvania 2009. February 2011. 3. Reed NG. The History of Ultraviolet Germicidal Irradiation for Air Disinfection. Public Health Rep. 2010;125(1):15-27.